Proof that I am not vegan (because all the cheese wasn’t enough? ): I have no idea what jackfruit is or where I might find it. 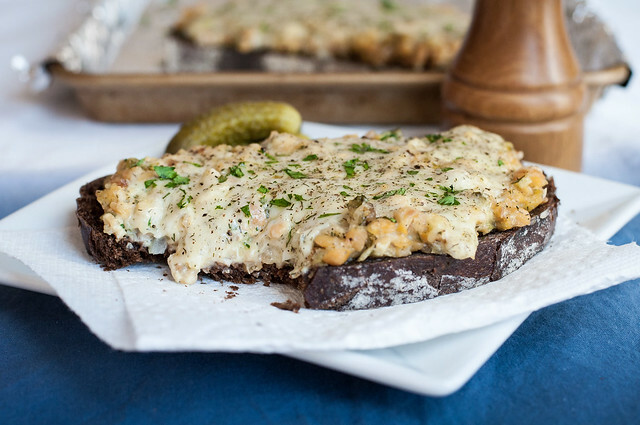 When I googled “vegetarian tuna melt”, that’s the first thing that popped up. It’s from Kristy’s blog, which is awesome, but I feel that Californians maybe have an edge in the jackfruit department. Any New Englanders know where I can get my hands on it? No? 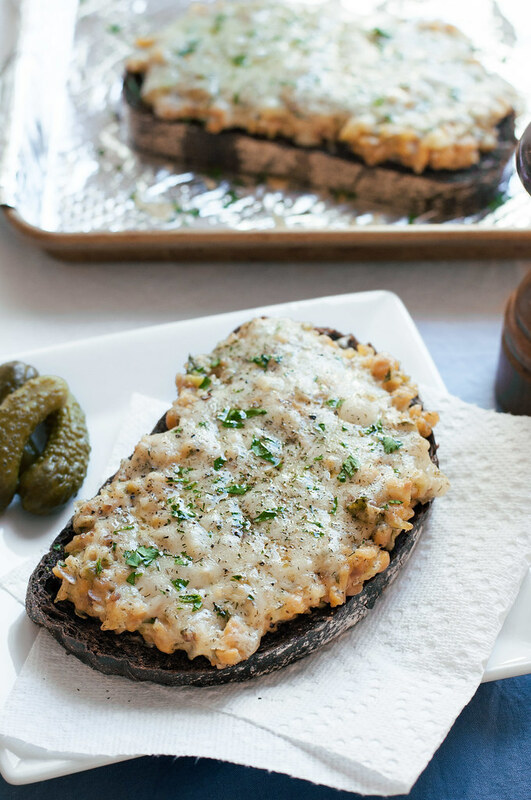 Okay, then let’s do this cheesy vegetarian tuna melt with slightly more available ingredients: garbanzo beans and sunflower seeds. Until probably age 26, before I reduced my intake of gluten and meat, tuna melts were a go-to quick dinner. We consumed them weekly as kids: they’re budget friendly (points for Mom) and void of most picky-eater triggers (points for us). They’re also built from ingredients we could find in our midwest kitchen, and later my college kitchen, at any time. Bread in some form (usually burger buns), Miracle Whip, pickles, canned tuna, and individually wrapped slices of cheddar cheese. They come together in under 10 minutes, with chopping pickles being the most strenuous task. It wasn’t until a little later in life, around the dawn of Food Network‘s popularity, that Mom started to upgrade the flavors and ingredients a bit. Lemon juice, dill, onion, salt and pepper. All revelations that perpetuated my tuna melt habit. As we discovered the “pure evil” of bread, my tuna melt habit disappeared. But you know what? I miss it. A lot. Sure, it’s creative to use lettuce, portobellos, or potato slices as a faux bun, but it doesn’t satisfy that deep, occasional longing for fluffy, chewy bread. NCK will continue to abound with gluten free recipes, but sometimes it’s okay to let a little bread into your life. A new bread shop opened down the road, and every time I stop in (more often than I care to admit), business is humming along. Perhaps we’re becoming a little less afraid of bread, especially when those bakeries are doing what they can to find top quality ingredients, of which only a few are required to bring a loaf into being. These days, I bring mine home, slice it, enjoy it for a couple days, then store the rest in the freezer for a weekend breakfast or next time I need breadcrumbs. I also miss dinners that are truly easy and quick, not purportedly 30 minutes. With vegetarian fare, it’s never as easy as slapping a chicken breast into a pan with some sauce. You must chop things and usually boil things, standing at the stove to ensure you don’t start a potholder or a small child on fire. Cooking is indisputably therapeutic for me, but in the midst of the moving box wreckage, I’m reminded of the necessity of easy dinners. A foreshadowing of dinner with children, perhaps? There is a time and a place for Miracle Whip. This is not it. It must look appetizing. For some contrast and color, I like dark pumpernickel bread, yellow mustard, and a sprinkle of fresh parsley and coarse pepper on top. It’s open faced, keeping bread intake down. 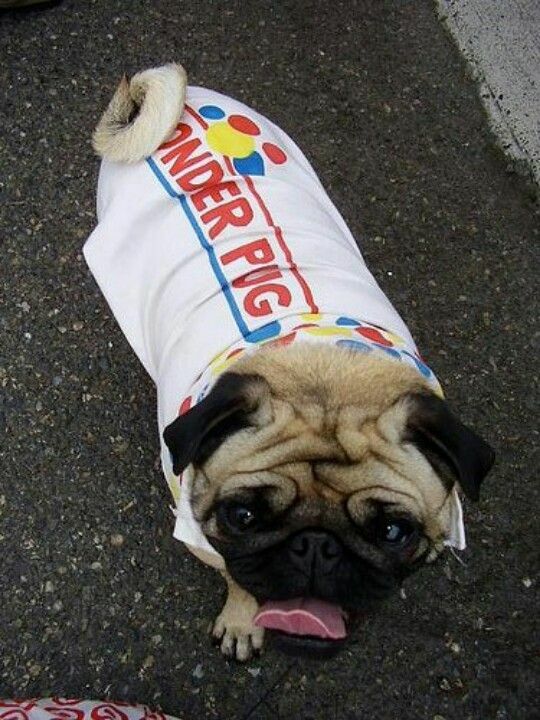 Pickles, and not much else, must be served on the side. It’s not a choking hazard. Sharp raw sunflower seeds? No thank you. Garbanzo beans alone can feel a bit unwieldy to bite into, and the soft, finely chopped sunflower seeds really make the texture approachable. I know I said quick, but then I go and tell you to soak sunflower seeds for TWO HOURS?! I come with options, though. One, if you eat late, plop the sunflower seeds in water the second you walk in the door, then go about your laundry or workout and they’ll be ready when it’s time to whip up vegetarian tuna salad for dinner. Two, start the soak in the morning, before you leave. Keep the bowl covered and place it in the refrigerator and allow the seeds to soak all day. Last, skip the sunflower seeds altogether. 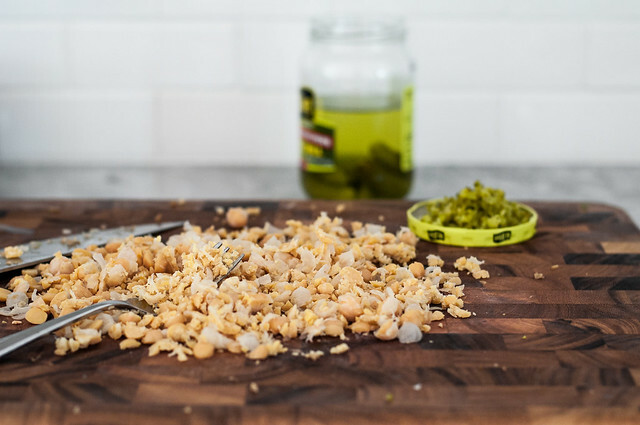 They add just under a quarter cup of bulk, so you’ll either need to scale back on the mayo a tad, or make up for that volume in the form of extra chickpeas, pickles, or onions. 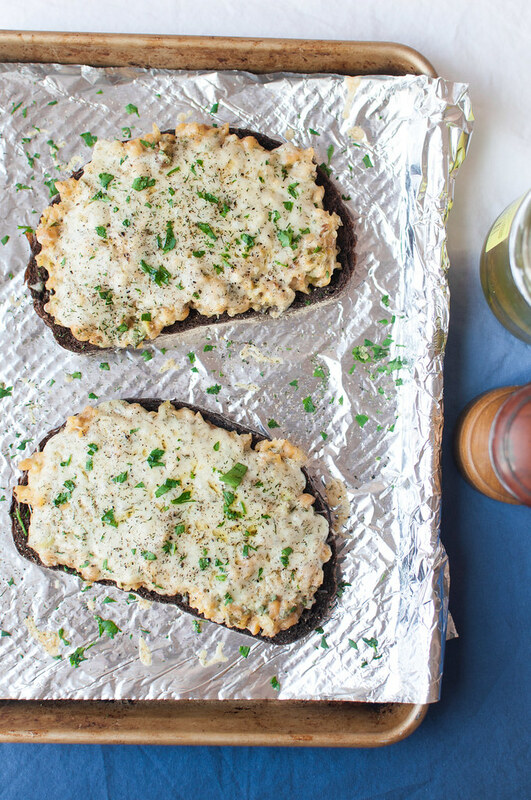 In any case, you’ll be left with a slab of toasty bread and creamy, warm, meatless “tuna” filling blanketed in that essential layer of cheese. Not all cheese is vegetarian. If you’re going for meatless, you won’t need to worry about that. However, if you or someone eating these vegetarian tuna melts with you is a strict vegetarian, check the packaging to ensure that the cheese is not made with animal rennet. If you can’t find vegetarian havarti, another soft, mild cheese will work great. 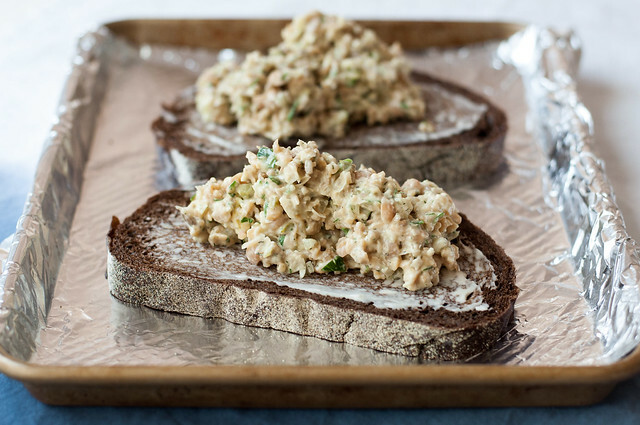 Mashed garbanzo beans and sunflower seeds make up the base of a creamy faux "tuna" salad with everything you love about tuna melts, minus the fish. 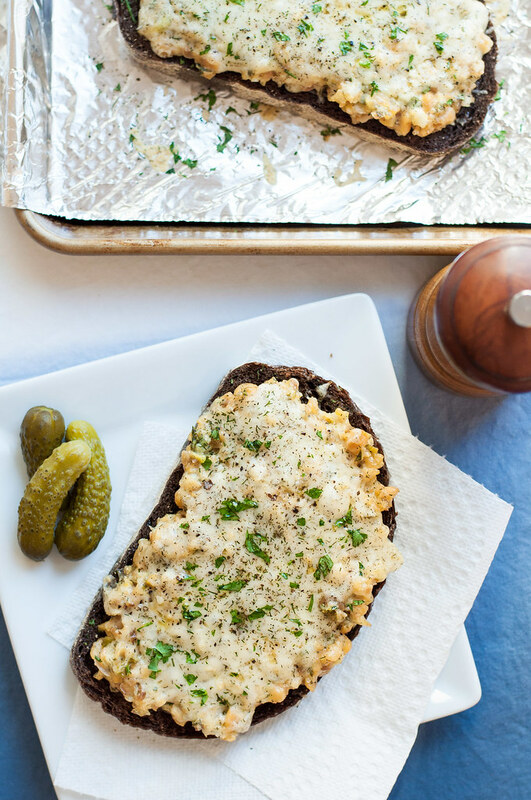 Slather it on a sturdy slice of bread and bake it with cheese on top for a fuss free dinner for just about anyone. Preheat oven to 350 (F). If using the sunflower seeds, drain well and chop finely. 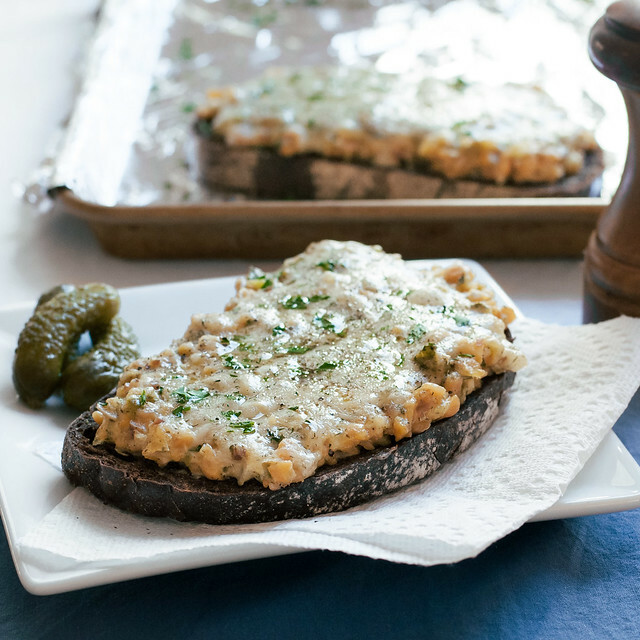 On a cutting board, roughly chop garbanzo beans, then press them down on the board with the back of a fork to mash. Combine sunflower seeds and garbanzos in a mixing bowl. 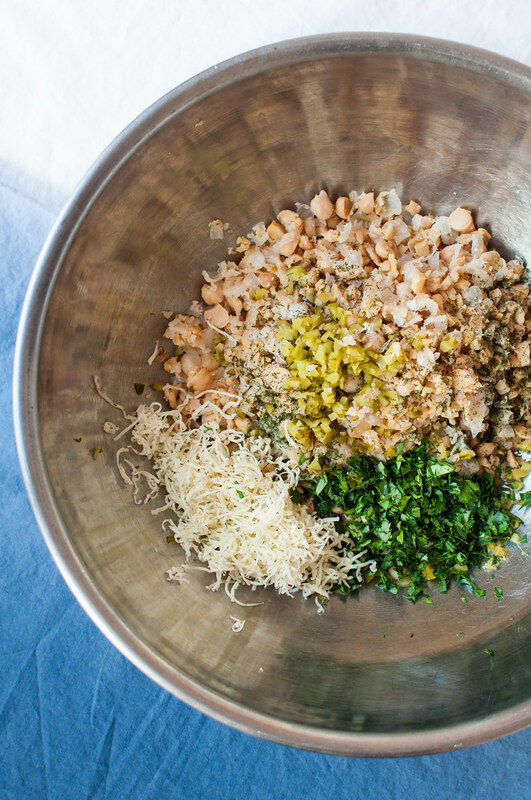 Add mayo, ¼ cup of the cheese, dill, pickles, onion, lemon juice, mustard, and fresh herbs (if using). Mix and season to taste with salt and pepper. If the mixture is dry, add more mayo and a bit more lemon juice. Line a baking sheet with foil, then place bread on it cut side up. Spread each slice with a thin layer of mayo, then a big scoop of the tuna salad mixture. Top generously with remaining cheese. Bake for 15 minutes, until bread is crisp and toasted at the edges and cheese is melted. Garnish with black pepper, a pinch of dried dill, and fresh herbs as desired, and serve with a pickle (or three) on the side! See blog post above for options to omit the sunflower seeds. If you can't find dill havarti, add a pinch more dried dill to the recipe. Prep time doesn't include soaking the sunflower seeds. Note: This page contains affiliate links. It does NOT contain sponsored content. 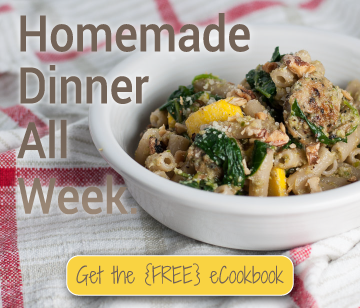 Affiliate links (to products I recommend, on Amazon) offset my ingredient and website maintenance costs, so I can keep bringing you throwback recipes like this one. Thanks!